On Monday April 20th, Environment Hamilton launched Greening Sacred Spaces, a joint project between Environment Hamilton and Faith and the Common Good, funded by the Ontario Trillium Foundation.The launch took place at the Anshe Temple Shalom. Greening Sacred Spaces is a practical program developed by Faith & the Common Good to assist faith communities in taking concrete actions to create a more sustainable and energy efficient place of worship and to educate members of the community about ecological issues. In celebration of Earth Day, we 'cleaned up' our act and had a demonstration of cleaning products that are safe for planet Earth. 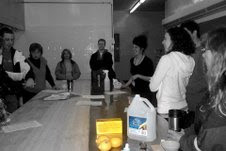 Participants were invited to make their own cleaning products from simple, harmless ingredients you can find around the kitchen. Participants numbered a solid 30 representing Hamilton area Faith groups.